Champaign, Ford, and Piatt counties shown in red. Illinois portion of Lake Michigan shown in light blue. 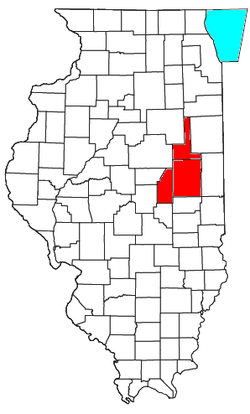 The Champaign–Urbana metropolitan area, also known as Champaign–Urbana and Urbana–Champaign as well as Chambana (to the locals), is a metropolitan area in east-central Illinois. It is the 191st largest metropolitan area in the U.S. It is composed of three counties, Champaign, Ford, and Piatt. The Office of Management and Budget has designated the three-county Champaign–Urbana area as one of its metropolitan statistical areas (the Champaign–Urbana, IL MSA), which are used for statistical purposes by the Census Bureau and other agencies. The area has a population of 231,891 as determined by the 2010 U.S. Census. The area is anchored by the principal cities of Champaign and Urbana and is home to the University of Illinois at Urbana–Champaign, the flagship campus of the University of Illinois system. (University students, even those from outside the area, are included in Census figures if they were counted by the federal Census). Journalists frequently treat the metropolitan area as just one city. For example, in 1998, Newsweek included the Champaign-Urbana Metropolitan Area in its list of the top ten tech cities (outside the Silicon Valley). Champaign-Urbana also ranked tenth as one of the top twenty-five green cities in the United States, in a survey made by Country Home magazine. ✪ Clockwork Orange from Champaign/Urbana IL "Still of the Night"
Illinois cities are as diverse as they are many. There are all kinds of different places to live in the state with varying municipal cultures — all the way from small, rural towns to the third-biggest city in the country. Here are the 10 best cities and towns to live in Illinois for 2018: 1. Northbrook. Northbrook is an idyllic little village of around 33,000 people located in Cook County on Chicago’s North Shore. A prime spot for those looking to escape the city and enjoy a slower pace of life, the Village of Northbrook is home to a number of historic buildings, including the old village hall, and village green that date back to the village’s incorporation in 1901, at which time it was known as Shermerville. The impressive education system in Northbrook is one of the main draws for families with a high school graduation rate, that is 15% higher than the rest of Illinois. 2. Winnetka. The richest town in Illinois, Winnetka is one of the most desirable places to live in the US. It is a desirable place to live based on the architecture alone. Winnetka is known for having a great education system, low crime rate, stable housing market. The unemployment rate in Winnetka is the 8th lowest in Illinois, and the median income is the 1st highest in the state. Located on the picturesque shore of Lake Michigan just 16 miles north of Chicago, Winnetka couldn’t feel much further from the hustle and bustle of the big city. 3. Buffalo Grove. Buffalo Grove is a great place for families with children to consider. This bedroom community about 35 miles northwest of Chicago doesn’t have a traditional downtown. But what it offers instead is ample green space, with 800 acres of forest and parkland, 50 miles of trails, and two municipal golf courses. The village enjoys economic stability and a wide range of employment options nearby. Crime rate is extremely low and the public education system is one of the best in the country, with a high school graduation rate of 95%. 4. Naperville. Home to a wealth of beautiful homes, amazing schools, and a charming downtown. Naperville is considered one of the wealthiest cities not just in Illinois, but the entire Midwest. Suffice to say Naperville is best suited for those who fancy more upscale quality of life, with a paycheck to match. If you can swing it, the high cost of living is well worth it. Naperville is one of the safest cities in America, with 130 parks and sports complexes located here. The residents are mostly college educated, with eight college campuses serving such a small population. 5. Galena. Galena, one of the most beautiful towns in Illinois, is a small community of 3,000 popular with retirees and vacationers. This popular resort town is known for its picturesque communities, farms, countryside, and Mississippi River views. It was voted the "Best Main Street in the Midwest", and is popular for couples who come for the atmosphere, upscale dining, and annual balloon festival. Today it is a popular tourist destination, hosting over one million visitors each year. An amazing 85% of the structures in Galena are listed on the National Register of Historic Places, a significant source of the city's charm and popularity. 6. Highland Park. Highland Park has all the benefits of living in a big city but without the traffic, crime or noise. Everybody loves Highland Park, especially those who need to make the daily commute into Chicago City. If you don’t need to venture into the big city very often, downtown Highland Park has plenty to keep you occupied with its own great shopping and restaurant district. Highland Park has an impressively low crime rate, 56% lower than the Illinois average. It also has some great schools that achieve consistently high graduation rates and a very healthy housing market. 7. Wheaton. Wheaton is just west of Chicago and home to over 50,000 people, its residents’ impressive average annual income of over $85,000. The people of Wheaton have had a lot of help in becoming some of the nation’s highest earners, as Wheaton is home to high quality schools, a nationally ranked public library, and a brilliant healthcare system. It isn’t all work and no play in Wheaton though as the town also features a thriving downtown area full of shops and restaurants and over 50 public parks offering an array of outdoor activities for its healthy citizens. Wheaton’s low crime rate is the cherry on the cake. 8. Marion. A huge crossroads in Southern Illinois, this town is full of relaxing activities such as golf, beaches, and parks. There are also many woods and creeks that promote tranquility. True nature lovers will find themselves at Crab Orchard National Wildlife Refuge where, in addition to native trees and flowers, you'll happen upon birds, deer, and any number of other critters. Marion is also home to many fishing ponds, walking trails, and nature hikes. From downtown charm to countryside bliss, Marion is well loved because its residents have it all. This might just be the most peaceful town in all of Illinois. 9. Park Ridge. Park Ridge is a small town and suburb of Chicago, a beautiful place to raise a family. Park Ridge has made much progress, yet retains its small hometown atmosphere and remains a wonderful place to live and work. Park Ridge lies on a ridge and the soil beneath Park Ridge resident’s feet is rich in clay, making it perfect for brick-making. The crime rate in Park Ridge is low, the education system’s accolades are many, and the housing market is stable. Given its compact, small-town nature, many destinations in Park Ridge are within easily bikeable distances. 10. Elmhurst. Both the Theatre Historical Society of America and the prestigious Elmhurst Art Museum, are located in this relatively small town of just 45,000 people. Elmhurst has an impressive average household income, that is almost 50% higher than that of the rest of Illinois. The education in Elmhurst is A+ with a number of fine schools and a high graduation rate. The crime rate is low, but unfortunately the same cannot be said of the cost of living, which is high with house prices soaring in recent years. A number of major developments have significantly changed downtown Champaign since the beginning of the 21st century. Beginning in the 1990s, city government began to aggressively court development, including by investing millions of dollars in public funds into downtown improvements and by offering developers incentives, such as liquor licenses, to pursue projects in the area. The 9-story M2 on Neil project is such an example. The project began in 2007 by taking down the facade of the deteriorated Trevett-Mattis Banking Co. which previously occupied the building site. The facade was retained on the M2 building. Residents first began to lease space in the M2 in the winter of 2009. The M2 includes not just condos for residential occupation, but also retail and office space in its lower floors, a common trend in new developments in the urban core. Across the street, a 9-story Hyatt Place boutique hotel opened in the summer of 2014. In the Campustown area adjoining the University of Illinois, the new 24-story highrise apartment building 309 Green was ostensibly completed in the fall of 2007 but had partial occupancy at least through the fall of 2008. It is 256 feet (78 m) tall, making it a full 3 stories higher than the older 21-story Tower at Third, the first contribution to the Urbana–Champaign skyline. The Burnham 310 Project, at 18 stories, which is also taller (in overall height), was finished in the fall of 2008 and includes student luxury apartments and a County Market grocery store. Burnham 310 connects downtown Champaign to Campustown. In 2013-14, four other mixed-use buildings (apartments above commercial) have been built in Campustown, with heights of 26, 13, 8, and 5 stories. On the University of Illinois campus, Memorial Stadium has gone under major renovation, with construction of new stands, clubs, and luxury suites. Across Kirby Avenue, the Assembly Hall, first built in 1963 and renamed the State Farm Center as part of a major renovation begun in 2014, continues to be the home of Illini basketball and is expected to resume hosting concerts and other performing arts after renovation is completed in late 2016. In the late 2000s, the restoration of the Champaign County Courthouse bell tower capped the expansion and renovation of Courthouse facilities and provided a striking focal point in downtown Urbana. These, among other developments, have given the Twin Cities a more urban feel. The outlying parts of the metropolitan area differ from the suburban areas of many other metropolitan areas. Instead of a sprawling suburban skirt that encircles the urban area, the urban area abuts large swaths of farmland, with small to medium-sized villages that originated as farming communities. But, as the willingness of professionals to commute longer distances has increased in recent decades, new residential developments have arisen on their edges, dotting the surrounding landscape. Some of these villages are home to as many as 5,000 residents or more, but most are significantly smaller. Most of these outlying communities, such as Savoy, Mahomet, St. Joseph, and arguably Rantoul and Monticello as well, are dependent on Champaign and Urbana for economic and infrastructure support. Predominantly, these cities and villages lie in Champaign County. These areas are populated to a substantial extent with commuters who work in Champaign or Urbana, but reside outside the two cities. Because higher paid professors, doctors and technology professionals who work for the University of Illinois at Urbana–Champaign, the many clinics and hospitals in town, or in the Research Park, are more likely to maintain cars for commuting longer distances and to afford owner-occupied single-family housing, these areas lacking in mass transit and high-density rental projects often have a higher median household income than Champaign or Urbana. In addition to residential developments in the surrounding, formerly agricultural communities, residential neighborhoods are also growing up in unincorporated areas within a short radius of the city limits, while the cities themselves are also expanding to annex areas of new development. While the annexed areas benefit from municipal services, developments that are willing to forego city sewer systems, libraries and police protection can enjoy the lower tax rates the surrounding townships levy, as fewer services are provided. Areas currently under construction extend as far as around Rising Road west of I-57 and north and east of Willard Airport. Some of this land is in Champaign Township, while some has been annexed to either Champaign or Savoy. Additional land development is occurring north of I-74 in land annexed by both Champaign and Urbana. On the eastern side of the city of Urbana, new business developments such as a Meijer, a planned Menards, and a commercial center with many restaurants and services have broken ground, as well as more suburban housing. The issue of land development is often hotly contested by local governments. In addition to arguments for and against development, the question of potential annexations, which remove property tax revenues from the surrounding townships while increasing the urban tax base (but also the demands on urban services) is a point of constant strife between the cities and the surrounding townships. On the other hand, the availability of higher-valued housing in areas belonging to the townships or surrounding villages, which is paid for by workers earning their money within the urban infrastructure also represents a movement of potential tax dollars from Champaign and Urbana to their dependent areas. Champaign County Historical Museum. Located in the Historic Cattle Bank built in 1858. Features exhibits on the history of the area and the midwest as a whole. Chanute Aerospace Museum. Showcases Illinois' role in aviation, featuring several hangars of planes on exhibit (Located in nearby Rantoul). Museum of the Grand Prairie. Features historic exhibits on life in the early midwest. Krannert Art Museum. Art Museum featuring both modern and classical art. Many changing exhibits. Spurlock Museum. Over 46,000 artifacts on display focusing around human culture and history throughout the world. Features some of the largest exhibits on Native North American and South American history in the nation. Monticello Railway Museum. Railroad museum with exhibits focused on central Illinois. Main attraction is the operating tourist railroad. Champaign Park District features many parks, hiking trails, and biking trails in the city of Champaign. Urbana Park District includes exercise and biking trails, Crystal Lake, a sculpture park, and other public facilities in the city of Urbana. Robert Allerton Park a private estate donated to the University consisting of a large manor house (now a conference center), formal gardens, and natural woodlands and prairie. Open to the public. The University of Illinois at Urbana–Champaign is located jointly in Urbana and Champaign and is the flagship campus for the University of Illinois system. Parkland College is a community college located in Champaign. The Champaign-Urbana Metro area is home to two hospitals, the Carle Foundation Hospital, and Presence Medical Center, with a combined total of over 550 physicians. Both hospitals are located less than a mile apart on University Avenue in Urbana. Both hospitals provide various specialized services, and Carle Hospital currently has a Level III Neonatal Intensive Care Unit, a Level I Trauma Center, and a medical helicopter service. Both hospitals have struggled to maintain their tax-exempt status with the State of Illinois. Carle Clinic Association was purchased by the Carle Foundation in 2010. It was renamed Carle Foundation Physician Services, and it maintains several locations next to the hospital, as well as other locations within Champaign-Urbana and other East Central Illinois cities. Christie Clinic, another smaller multi-specialty group practice, is headquartered in downtown Champaign. They are largely affiliated with Presence Medical Center but are not as closely linked as their Carle counterparts. Both hospitals and clinics are affiliated with the University of Illinois College of Medicine at Urbana, part of the larger University of Illinois College of Medicine, which has campuses in Chicago, Peoria, Rockford, and Urbana. The College has a teaching presence at both hospitals, although the facilities are somewhat more extensive at Carle Foundation Hospital. The Virginia Theatre in Downtown Champaign. The Champaign-Urbana Metropolitan Area is home to many theatres. The University is home to three theatre venues; Foellinger Auditorium, Assembly Hall and the Krannert Center for the Performing Arts. While the Assembly Hall is primarily a campus basketball and concert arena, the Krannert Center for the Performing Arts is considered to be one of the nation's top venues for performance and hosts over 400 performances annually. Built in 1969, the Krannert Center's facilities cover over four acres (16,000 m²) of land, and features four theatres and an amphitheatre. The Historic Virginia Theatre in downtown Champaign is a public venue owned by the city of Champaign and administered by the Champaign Park District. It is best known for hosting Roger Ebert's Film Festival which occurs annually during the last week of April. The Virginia also features a variety of performances from community theatre with the Champaign Urbana Theatre Company, to post box-office showings of popular films, current artistic films, live musical performances (both orchestral and popular), and other types of shows. First commissioned in 1921, it originally served as a venue for both film and live performances, but became primarily a movie house in the 1950s. Occasional live events were held during the 1970s and 1980s, including a live production of "Oh, Calcutta" and performances by George Benson, Stevie Ray Vaughan, Missing Persons, and the Indigo Girls. GKC Corporation closed the Virginia as a movie house on February 13, 1992, with the final regular film being Steve Martin's "Father of the Bride". The theatre once again began holding regular live performances when it was leased to local gospel singer David Wyper in 1992. The Champaign-Urbana Theatre Company was formed to perform major musicals and opened their first season with "The Music Man" that June. Control passed to the Virginia Theatre group in 1996 and the theatre became a non-profit public venue. The Champaign Park District assumed control of the facilities in 2000. Its original Wurlitzer theatre pipe organ has been maintained by Warren York since 1988 and is still played regularly. The Art Theater in downtown Champaign began as Champaign's first theatre devoted to movies, the Park, in 1912, and is a small venue showing films not normally playing at the box office. The theatre is the only single-screen movie theatre with daily operation as a movie theatre in Champaign-Urbana. The Virginia, which hosts Roger Ebert's Annual Overlooked Film Festival, is also single-screen, but only opens for special showings and events. Rapp and Rapp's 1914 Orpheum Theatre closed in the mid-1980s and now houses a children's science museum. Parkland College in Champaign features a small theatre called the Parkland College Theatre and a planetarium called the William M. Staerkel Planetarium. The area has originated a great deal of musical talent, starting with REO Speedwagon, Head East, Dan Fogelberg and including HUM, Poster Children, Hardvark, The Moon Seven Times, Braid, AMASONG, Castor, National Skyline, Love Cup, Absinthe Blind, Øde Vinter, 酸葬儀 acidfuneral, Headlights and The Beauty Shop. Some lesser known artists like Alma Afrobeat Ensemble, Zirafa and Spinnerty, d-Lo, Bozak, Melodic Scribes, DJ Librarian, UC Hiphop, and Zmick are also worthy of note on simply a local scale. Champaign-Urbana is relatively well known for producing a rich array of emo, college rock, and black metal. The cities now host Pygmalion Music Festival on an annual basis, presented by the Nicodemus Agency and Krannert Center for the Performing Arts. Past performers include Iron and Wine, The Books, Yacht, Rjd2, Yo La Tengo, Black Mountain, Asobi Seksu, Times New Viking, of Montreal, Danielson, Man Man, Okkervil River, Andrew Bird, Questlove, and more. The 2010 festival took place September 22–25. Besides many print outlets, commercial radio stations, and TV stations, Champaign-Urbana has several academic, homegrown and not-for-profit media outlets. WEFT 90.1 FM is a community radio station begun by a group of radio enthusiasts, artists, and community-minded individuals working together to realize the potential of bringing a variety of programming and people together behind one frequency. Since 1981, WEFT has broadcast music from around the world and East Central Illinois, news, and public affairs on shows hosted by an all-volunteer staff of air shifters. It also airs programming from national sources including Pacific. WRFU-LP is a low power community radio station owned and operated by Radio Free Urbana. The station was built by hundreds of volunteers from the region and around the country in November 2005 at the ninth Prometheus Radio Project barnraising. WRFU broadcasts music, news, public affairs, and political activism (usually left-leaning) to listeners at 104.5FM. Illini Media, located at 5th and Green in campustown, is home to the college's alternative radio station WPGU 107.1. The Illini Media Building is also home to the Daily Illini, the student-run daily newspaper, and Buzz Weekly which has quickly become a popular source for arts & entertainment news in the Champaign-Urbana area. Smile Politely, an online magazine focused on arts, entertainment and alternative news, opened in 2007 and is seen as the successor to previous print efforts like The Octopus, and The Hub Weekly. Interstate 74 runs east–west through Champaign and Urbana. Interstate 57 runs north–south through the west part of Champaign. Interstate 72 terminates at Champaign. U.S. Routes 45 and 150 pass through the cities as well, and Illinois Routes 10 and 130 originate in Champaign and Urbana, respectively. The Champaign-Urbana area is served by the Champaign-Urbana Mass Transit District, which has its main interchange at Illinois Terminal. Illinois Terminal also provides service by Greyhound Lines, Burlington Trailways, and the Amtrak City of New Orleans, Illini and Saluki routes, making it a regional transportation hub. The University of Illinois Willard Airport in Savoy on the south side of Champaign provides air service through American Eagle. While greater Champaign-Urbana does not feature any professional sports teams, the University of Illinois fields many teams which compete in the Big Ten Conference. Two large sports centers (Memorial Stadium and the State Farm Center, formerly the Assembly Hall) are located in the south-east portion of Champaign. Memorial Stadium is a football arena where the Fighting Illini football team plays, and the State Farm Center is the home of the highly successful Fighting Illini basketball team. The NFL's Chicago Bears played in Memorial Stadium for the 2002 season while Soldier Field was being modernized and refurbished. The city of Champaign has been working with the Frontier League to create a privately owned professional baseball team. The team was scheduled to start playing in the 2009 baseball season, but was delayed in 2008 to the 2010 season at the earliest. Since then however, there has been no development on the matter. The University of Illinois hosted the 2013 NCAA Division I Men's and Women's Tennis Championships in May at the Kahn Outdoor Tennis Complex next to the Atkins Tennis Center and Eichelberger Field just south of Florida Avenue in Urbana. The Illini Men's Tennis team won the 2003 NCAA tennis championships and is highly ranked nationally. Since 2009, Champaign-Urbana has been the home of the Illinois Marathon. Tatyana McFadden, five-time US Paralympian winning 17 medals and 18 IPC World Championship medals. James Tobin, won Nobel Memorial Prize in Economics in 1981. ^ "Population and Housing Occupancy Status: 2010 - United States - Metropolitan Statistical Area; and for Puerto Rico 2010 Census National Summary File of Redistricting Data". American FactFinder. U.S. Census Bureau. 2010-10-05. Retrieved 2013-04-09. ^ Howie, Michael (October 25, 2015). "Downtown: My, how you've grown". The News-Gazette Times. ^ Dodson, Don (June 7, 2017). "Workers take apart facade in downtown Champaign". The News-Gazette Times. ^ Des Garennes, Christine. "Apartments trump condos in downtown Champaign housing boom". The News-Gazette Times. ^ Wickman, Natalie. "Champaign officials: Proposed boutique hotel will fill niche". The News-Gazette Times. ^ Dodson, Don. "Apartment project trimmed back". The News-Gazette Times. ^ Wurth, Julie. "High-rise residents happy to be settling into apartments". The News-Gazette Times. ^ Pringle, Kirby. "Tower turning 35, but controversy over its construction lingers". The News-Gazette Times. ^ "Museum of the Grand Prairie Official Website". www.museumofthegrandprairie.org. Retrieved 12 May 2017. ^ "Orpheum Children's Museum". www.orpheumkids.com. Retrieved 12 May 2017. ^ "Spurlock Museum, U of I". www.spurlock.uiuc.edu. Retrieved 12 May 2017. ^ Museum, Monticello Railway. "Welcome · Monticello Railway Museum". www.mrym.org. Retrieved 12 May 2017. ^ "State removes Carle's property tax exemption". Retrieved 12 May 2017. ^ Virginia Theatre Wurlitzer. Theatreorgans.com. Retrieved on 2013-08-17. ^ "初めてのピルで避妊効果がわからない". www.thecuart.com. Retrieved 12 May 2017. ^ "vegan - Champaign-Urbana - LocalWiki". localwiki.org. ^ Gentile, Jay (6 May 2015). "19 Illinois Cities, Ranked by Their Food and Drink". thrillist.com. ^ "The Greatest Midwest Food Towns". midwestliving.com. ^ "Champaign-Urbana Named the Midwest's Greatest Food". enjoyillinois.com. ^ "薬剤師の彼女のための秘密のブログ". www.radiofreeurbana.org. Retrieved 12 May 2017. ^ "the217.com". Retrieved 12 May 2017. ^ Minor League Team in C-U Delayed IlliniHQ.com. September 3, 2008. Accessed October 28, 2009. Wikimedia Commons has media related to Champaign-Urbana Metropolitan Area.